The Coating is single-component polyurethane, elastic, and water vapor permeable. It is also UV and wear-resistant. COELAN Boat Coating is suitable for fiberglass wood, flexible rubber, fabric, plastic, and metals such as aluminum and steel. COELAN coating is useful in protecting and preserving wood decks, hatch covers, spars, wood trim, railings, wood outdoor furniture, and patio decks. It is also of use a roof sealant, and for protecting plastic lawn furniture, rubber dinghies, skin-on-frame (SOF) kayaks, steel, bronze and brass fittings, the interior of RVs, and chrome. Many historically significant museum vessels have been applied the coating for preservation of their surfaces. 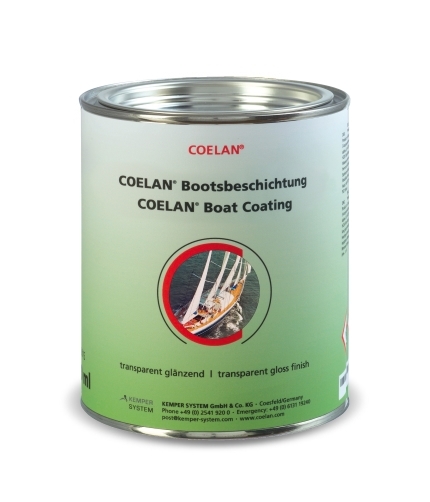 COELAN is also for protection of the exterior and interior surfaces of many public transport vessels, tall ships, yachts, cruise ships including other luxury vessels. COELAN Boat Coating Products are recognized widely as the best coating for wood and for finishing in the market today. Independent tests done have proven that COELAN outlasts and outperforms all other high-quality varnish. If used by following the directions, the requirement for maintenance is reduced with no re-finishing needed for several years. 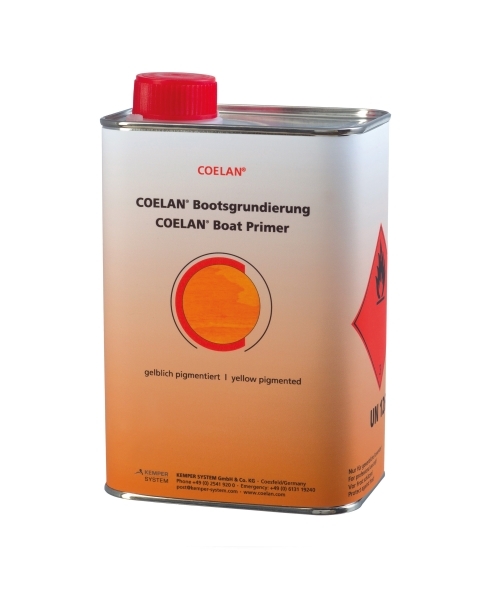 COELAN is extensively used by many in yacht and ship building industry and by private boat owners. PREMAPRO is COELAN Marine Coating's exclusive importer for the USA, Canada and the Caribbean. 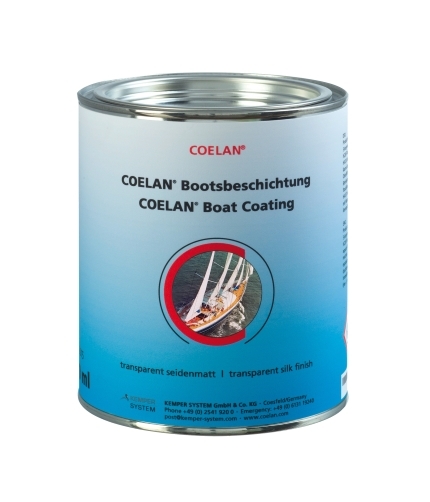 For more information about COELAN Boat Coating, click here for detailed product information. To learn more about our products, please contact us. 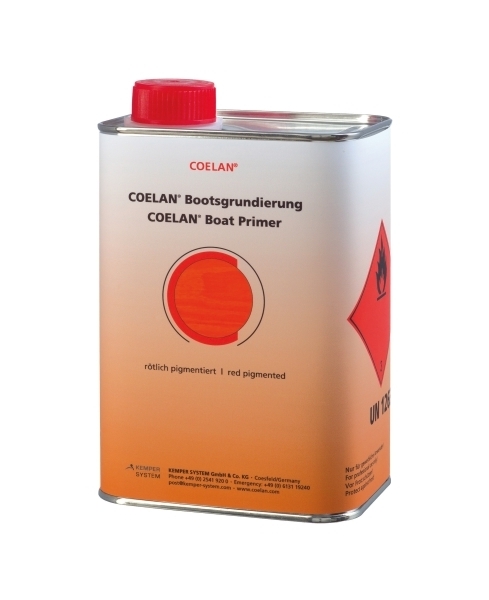 Before using the product, please read COELAN Application Guidelines for Boat Coatings ! COELAN Coating cannot be used to bond with silicone joints or joints sealed with silicon that contains polyethylene or polypropylene sealing compounds. Elastic, single-ingredient, UV and wear-resistant, and water-vapor permeable polyurethane coating. Best use on wood, steel, fiberglass, aluminum, plastic surfaces, and flexible rubber. To get custom coloring, mix COELAN color paste into this coating. 1000 ml / square m. or 31.41 fl oz / 10 square ft. The coating is best applied as one final layer over a glossy foundation for that matte - silky finish. Best used on wood, steel, fibreglass, flexible rubber, plastic surfaces or aluminium. Due to high risk of skidding when used, the finish is not suitable in areas that need secure footing. Cannot be mixed with COELAN color paste. 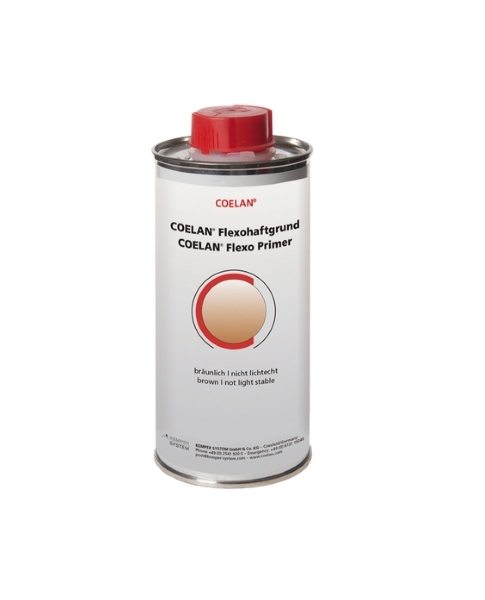 200 ml / square m. or 6.28 fl oz / 10 square ft.
COELAN Flexo Primer LE is best used on transparent coatings on the elastic surfaces of inflatable dinghies, fenders, boat cushions and rub rails. 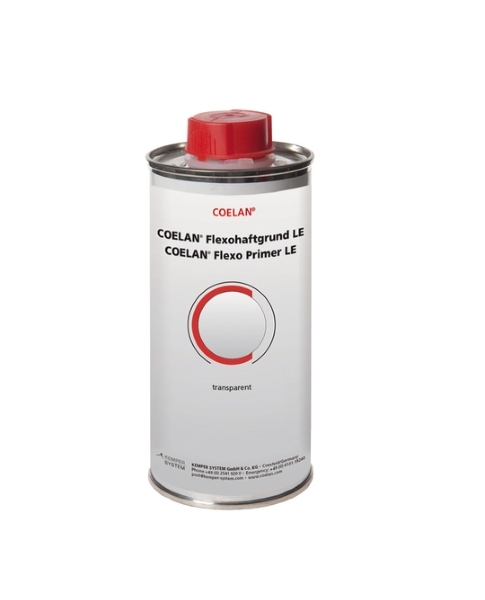 COELAN Flexo Primer LE primer is suitable for application on surfaces where un pigmented COELAN Transparent Gloss Coating will be applied. Their application allows the original color of the surface to show. 50 - 70 ml / square m. or 1.57 – 2.2 fl oz / 10 square ft.
COELAN Flexo Primer is best used on colored coatings on elastic surfaces of inflatable and rubber dinghies, fenders, boat cushions, rub rails, patio shades, skin-on-frame (SOF) kayaks, and other similar surfaces. The Flexo Primer when combined with COELAN Color Paste and COELAN Transparent Gloss Coating can be used to cover original surface covers. COELAN red pigmented primer is elastic and it is for applying on different types of wood that is dark grained such as redwood, dark red oak and mahogany. Creates chemical and mechanical bond with COELAN transparent gloss coating. Essential on all exposed wood. Ultraviolet (UV) inhibitors extend the coating life. 200 ml / suare m. or 6.28 fl oz / 10 square ft.
COELAN yellow pigmented primer is elastic and it is for applying on soft and hardwood surfaces such as teak, fir, spruce, larch, pine, and other wooden surfaces. Creates chemical and mechanical bond with COELAN transparent gloss coating. Essential on all exposed wood. Ultraviolet (UV) inhibitors extend the coating life. 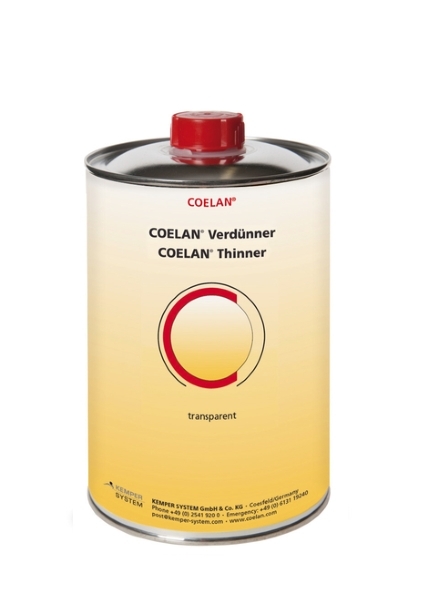 COELAN Thinner is used for diluting COELAN Boat Coating for easy spray applications on vertical and surfaces where sprays are required (for more information, please refer to the application directions). We recommend keeping Thinner available when working for cleaning brushes and tools and to clean drips. COELAN Color paste is used in combination with Coelan Transparent Gloss Coating. This is to produce colors for wood, metal, fiberglass, fabric, and rubber surfaces. 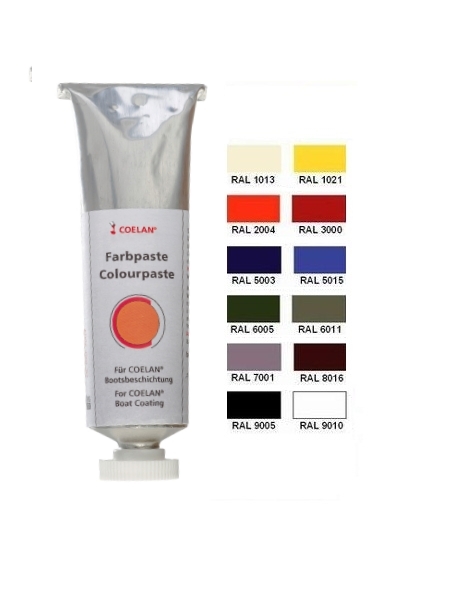 COELAN Color paste is optional but an essential part in the Coating process. Coelan Color Pastes can create custom colors to match existing surface colors and for decorative applications. Container Size and Identification No. COELAN Antislip Glass Powder is for use in increasing slip resistance on wood, metal, rubber, fabric, and plastic surfaces that are coated with COELAN. 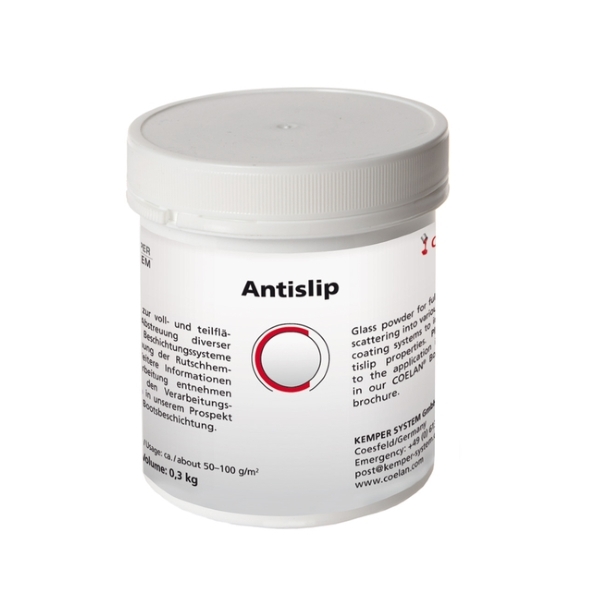 It is applied by distributing the transparent powder on a surface that is still-wet. 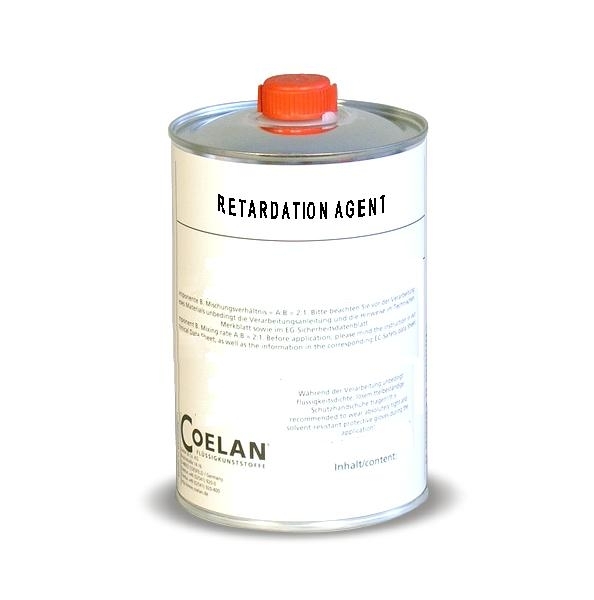 100 to 200 g / square m. or 3.27 to 6.55 oz / 10 square ft.
COELAN Retardation Agent slows the curing process of COELAN Boat Coating in tropical conditions of high humidity (> 85%), high temperature (> 30 °C / 86 F). The addition of COELAN Retardation Agent prevents the coating from becoming unworkable, minimizing brush drag, uneven surface finish and by extending the curing time resulting in a better overall appearance. The technical content and data in this catalogue are provided according to the best of our knowledge and ability. Products illustrated in this catalogue may not be fully representative of our range, and actual product colors may differ from those depicted in photographs. Advice provided herein is not legally binding, since we cannot control or foresee the situations and conditions in which the products are used. Product descriptions and technical information presented here are subject to change at our discretion. Publication of revisions to existing data will render all previous technical data sheets and product instructions invalid. If you have any questions regarding our services or products, please consult our technical department for additional information. All warranties and client agreements must be set out in writing. Other terms and conditions may apply.